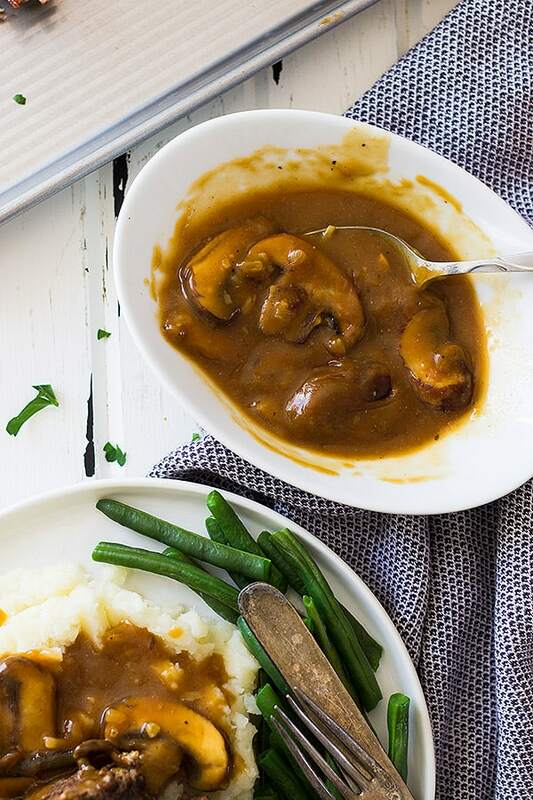 This Easy Mushroom Gravy is quick and simple. 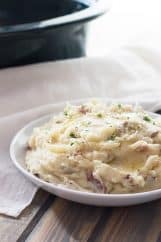 It is delicious on top of steaks, mashed potatoes or even meatloaf! I’m finally getting around to posting this easy mushroom gravy. 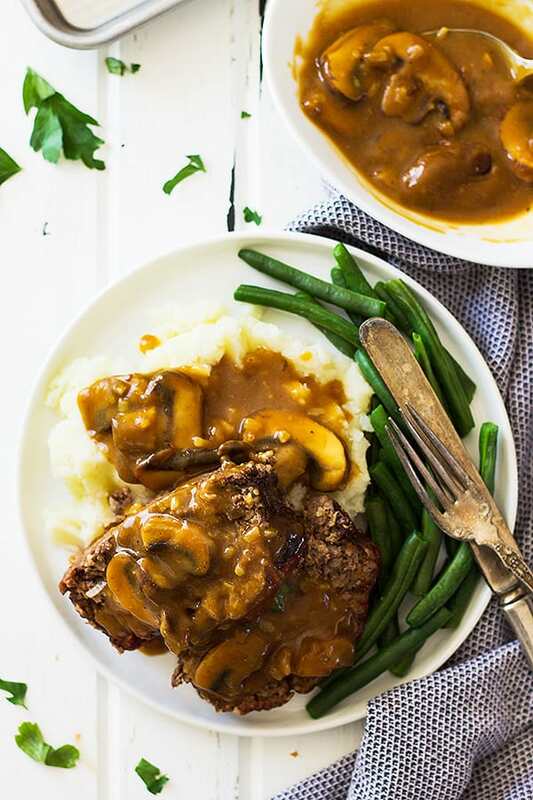 It is one of my favorite gravy recipes and the rest of my family loves it as well, yes even my picky mushroom hating husband will eat it. 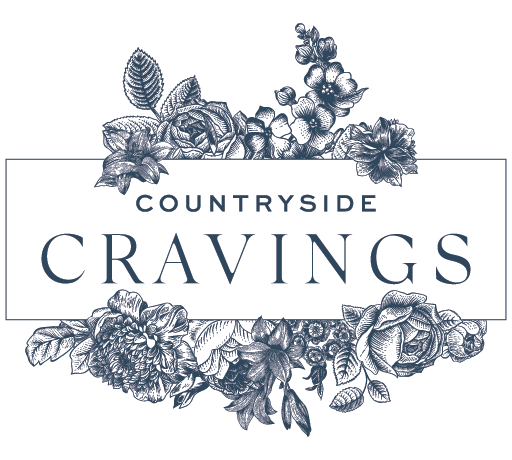 We like it on top of perfectly cooked steaks, creamy mashed potatoes and old fashioned meatloaf. Another favorite is to use a big fluffy pumpkin roll or piece of bread to wipe up any remaining trace of this liquid gold! 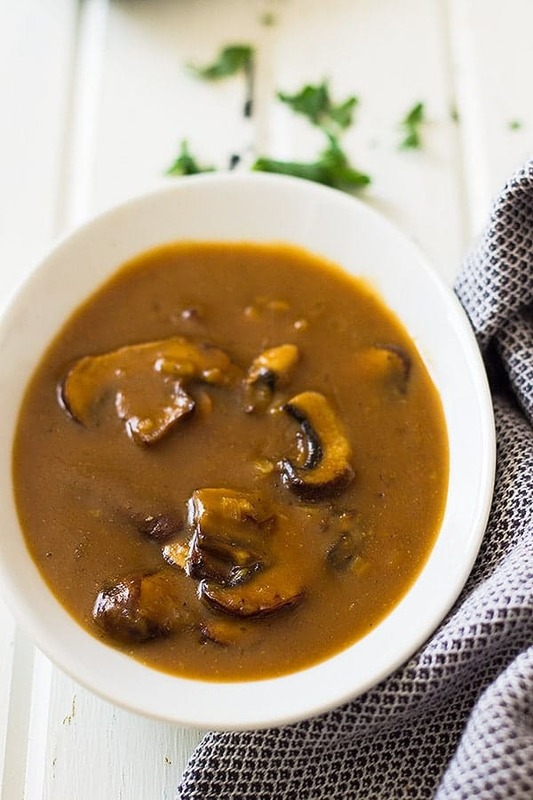 This mushroom gravy could also be a great side dish for Thanksgiving dinner! Just use chicken broth in place of beef broth and you could even use some of the pan drippings from the turkey in place of the butter. 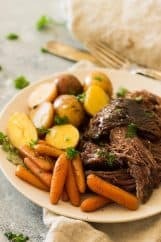 Don’t be intimidated by gravy, it really is easy to make and if you follow my no fail method it will be a success every time! 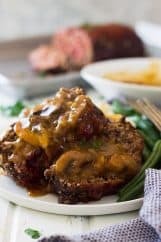 And not only does this mushroom gravy taste great on meatloaf it’s also great on steak!! So to make this mushroom gravy start off cooking the chopped onion and mushrooms in olive oil, butter or pan drippings (your choice). I like to cook them until they are nicely browned. <– This is where a lot of the flavor and dark brown color comes from in this gravy so don’t skip this step. Next, add in the garlic and give it a stir, it cooks quickly and you don’t want to burn the garlic so be ready for the next steps. Now, this is the secret step to making your gravy successful—just stir in the flour with the mushrooms. Yes, that is it!! Whisk in the broth and you will have a smooth gravy every single time! See that wasn’t so hard! And while you are whisking be sure to scrape up all the browned bits from the bottom of the pan! Stir in the flour and "cook" for 1 minute. Whisk in the broth and scrape up all the browned bits from the bottom of the pan. Reduce to a simmer. Simmer until thickened, then remove from heat. Taste for salt and pepper and season to taste. Can also use chicken or vegetable broth in place of the beef broth but it won't be dark in color. To achieve that dark brown color be sure to brown your mushrooms well and scrape up all the brown bits at the bottom of the pan when stirring in the beef broth. 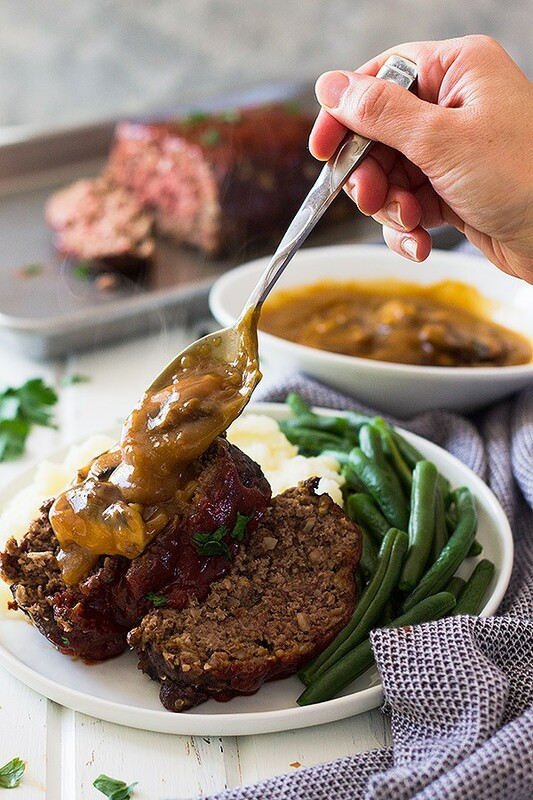 Made This gravy today to compliment my meat loaf, just added a little bouquet for a darker color and some w sauce for extra flavor, I was absolutely delicious. Will definitely be making this mushroom gravy again. Simply amazing!!! Used gf flour and it turned out SO GOOD!!! 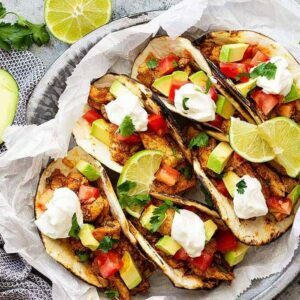 Easy peasy and delish! YAY!! I’m so glad you liked it and thanks for telling us about your substitution!! Thank you!! I am so glad you liked it!! 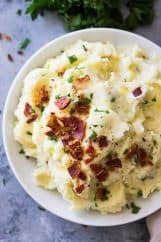 I love making mashed potatoes in the slow cooker! Thanks Joanne!! 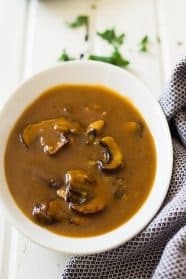 Easy and delicious, 10 year old doesn’t enjoy mushrooms but loves this gravy! Family favourite now! Thank you so much!! I am so glad you liked it and thank you for sharing! !